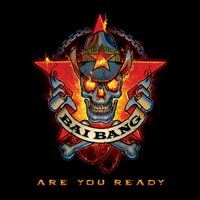 I remember a couple of years ago I bought an album with this Swedish band BAI BANG<?xml:namespace prefix = o ns = "urn:schemas-microsoft-com:office:office" /> and I totally disliked it and gave it away the very next day. So to be honest I did my best to forward this promo-CD called ‘Are You Ready’. The band’s 6th release, by the way. But I was stuck with it. Well... I threw it in my totally exhausted CD-player and I discovered that this band is not that bad after all. The music reminds me of a mix between Poison, Def Leppard, Aerosmith, Ratt... and even Alice Cooper... especially on the very first track “I Love the Things You Hate”. Then add a few sleaze rock bands and then I think you have a pretty good idea what to expect. On the track “Bad Boys” they even sound a bit like Twisted Sister. The rest of the songs are sadly not above average in my humble opinion but this disc is still suitable for a day at the beach in company with a few friends and a million beers. Check it out and be your own judge.